WESTBROOK, Maine (NEWS CENTER) — You know those car commercials where someone gets a car with a big red bow on it? That actually happened to a non-profit in Westbrook Monday. Idexx surprised the staff and teens at My Place Teen Center with a van. 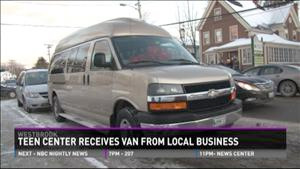 It will provide a vehicle to pick up more than fifteen hundred pounds of food a week to serve the kids, as well as rides home for when the weather is bad and transportation to field trips. Until now, staff members were using their own vehicles for those services. Quirk Chevrolet is also donating a 30,000 mile maintenance package to take care of the van.